Our family originally settled in the 1880′s along the upper reaches of the Russian River, in the picturesque valley of Ukiah, California. 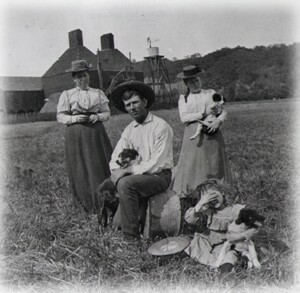 Some of our family pioneers, taken in front of the family hop kiln around the turn of the century. Early machinery on the Johnson Family Ranch. Farmers in the Ukiah valley began growing Bartlett pears and other types of pears. Today the fifth and sixth generations of Johnson Family Ranch, Inc. are tilling the soil and personally overseeing every facet of the farming and packing operation. Working together, we Johnsons provide our customers with the very finest grapes and pears. Pete Johnson with daughter Gwendolyn in the Redwood Valley vineyard. Steve Johnson (at right) in the pear orchard in Ukiah with brother Pete and niece. Susie Johnson (at left) with son Pete and granddaughter. Before becoming a farmer, Pete and Steve's dad Bill Johnson was a landscape architect who loved working the land around the old farmhouse where he grew up with his siblings.